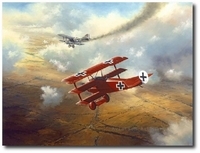 "First Victory" is co-signed by WWI Ace George Vaughn. Before enlisting in the Army, Vaughn learned to fly while attending Princeton University in 1917. He completed his flight training in England and was assigned to 84 Squadron as an S.E.5a pilot in May 1918. Before his transfer to the United States Air Service on 27 August, he scored 7 victories while serving with the Royal Air Force. Vaughn scored his first two victories with the 17th Pursuit Squadron on 22 September 1918. 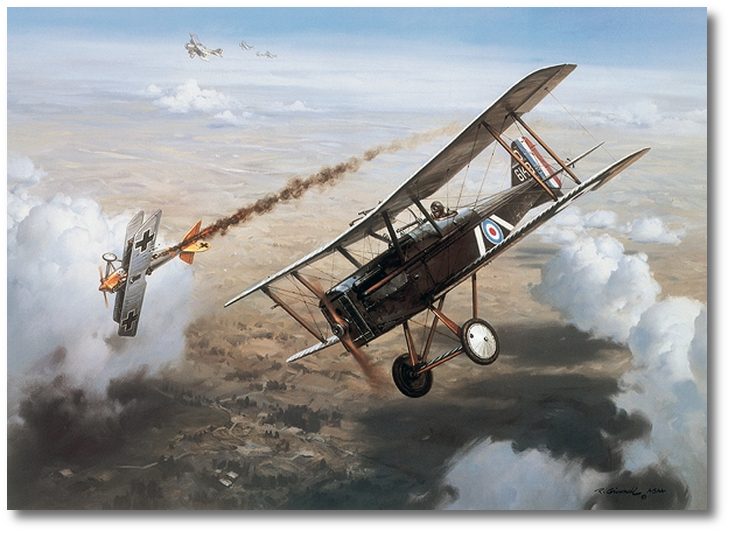 Twice that day, he engaged Fokker D.VIIs, downing Friedrich Noltenius of Jasta 27 and Karl Bauerbfeind of Jasta 34 before his own Sopwith Camel was shot down by Wilhelm Neuenhofen of Jasta 27. Vaughn scored 4 more victories by the end of the war. Shown here is his first victory over a Pfalz DIII over Beaucourt.